If you’re a boatbuilder, one of your most difficult challenges is knowing when to replace a model. After all, designing a new boat is a costly endeavor, to say the least. Way before fiberglass meets resin, you’ll have spent at least a million dollars in design, tooling, and testing. To make sure you get that money back, plus a nice profit, you need to build and sell as many of each model as you can. 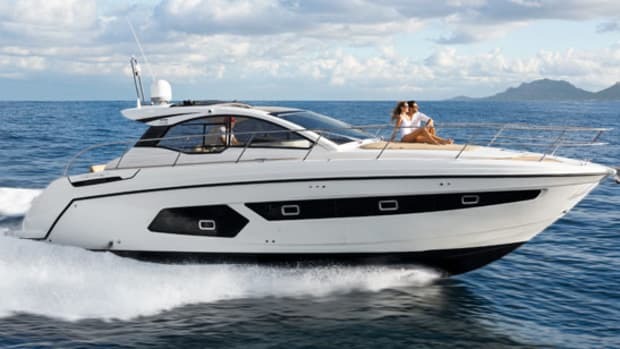 But if you keep a model in the line-up too long, sales will begin to slide, and before you know it, you and your dealers are left with a lot of boats that no one wants. On the other hand, if you pull the plug on a model too soon, you’ll leave money on the table. The secret to finding the sweet spot between these two extremes consists of one part knowing your buyers, one part knowing your competition, and one big part being a good guesser. 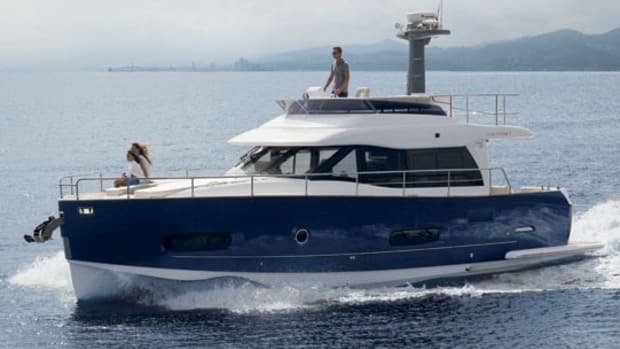 Since it started building boats in 1969, Azimut has guessed right more times than most other builders, which is one reason it’s been profitable every year and is today one of the world’s very few debt-free production boatbuilders. When it comes to juggling the model mix, few do it better. 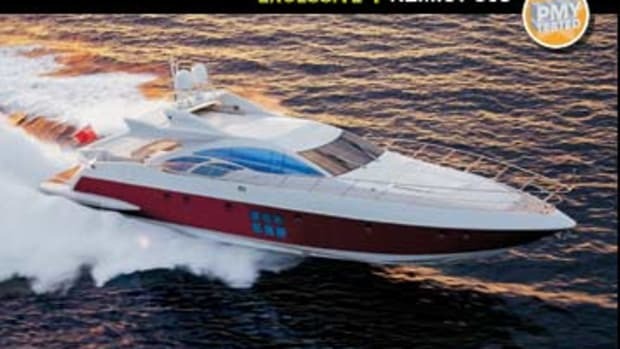 And that explains the appearance of the new 82 at last September’s Genoa Boat Show and this year’s Miami International Boat Show. 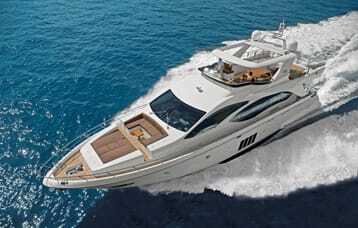 She replaces the Azimut 80 Carat, which first appeared way back in 2001, a remarkable seven-year run. 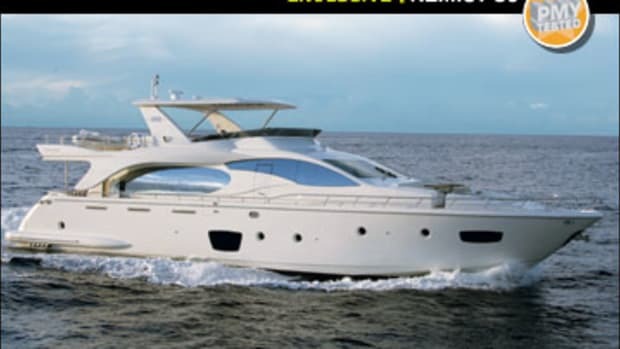 And an Azimut marketing rep assured me that the boat was still selling well until the worldwide economic downturn hit last fall. 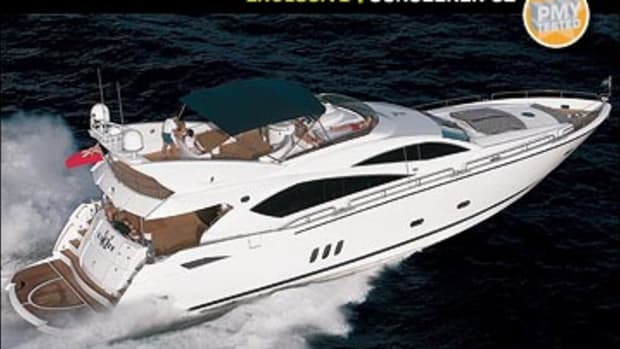 Mindful of the 80’s popularity, Azimut focused on retaining what made her so popular while updating what had gone out of style during her considerable lifespan. It started by making her bigger, although not by as much as you might think. Despite their numerical designations, the 82 is only 7" longer overall (84&apos;3" versus 83&apos;8") and just 1&apos;4" wider (20&apos;4" versus 19&apos;0"). Her draft has diminished marginally, from 5&apos;11" to 5&apos;8", due primarily to reworked propeller pockets and considerably flatter aftersections (6 degrees versus 12 1⁄2 degrees). The 80’s V-drives have been retained, but standard power has changed from 1,500-hp MTU 12V 2000s to 1,675-hp CAT C32s, a function more of engine evolution than anything else. And the Carat designation has disappeared. One reason LOA has changed so little may be that Azimut had to beware of bumping up against the next boat in its flying-bridge line. That would be the 85, which at 88&apos;0" is only 3&apos;9" longer than the 82. Remarkably, the two have virtually identical accommodation layouts: amidship master (the 85 has but one window per side), forepeak VIP, and two guest staterooms, all with en suite facilities. They’re also both powered by twin CAT C32s (the 85 gets the 1,825-mhp ACERT version) and have two-person crew quarters abaft the engine room. That Azimut would offer two models that are so similar seems odd, but since the 85 was introduced in 2005, it may be due for an update, too. But the biggest statistical difference between the 80 and 82 is in their displacements: 57 tons for the former, 75 for the latter. 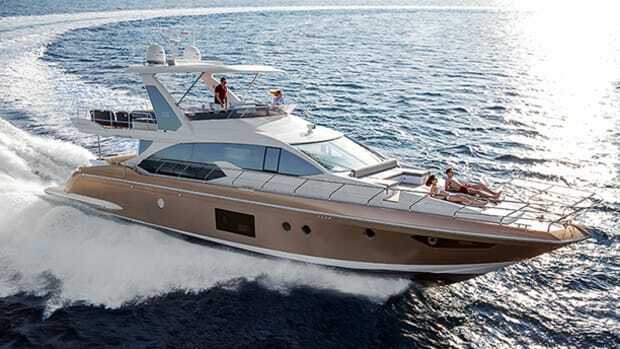 That’s a 36,000-pound spread that the Azimut rep was unable to explain. Nor can I imagine what could account for such a difference. Indeed, walking through the 82, what impressed me most was not the upgraded trimmings—Azimut has always used a lot of hardwood, marble, leather, high-end appliances, and such. It was how much more angular the 82’s saloon is. Where the 80 offered two curved settees plus a third curved one that provided half of the dining room seating, all three of the 82’s saloon settees are rectangular couches, and the dining room has a traditional table with eight individual chairs. And while the 80’s galley is directly across from the dining table (great for convenience), the 82’s is located forward and is separated from it by a bulkhead (great for privacy). 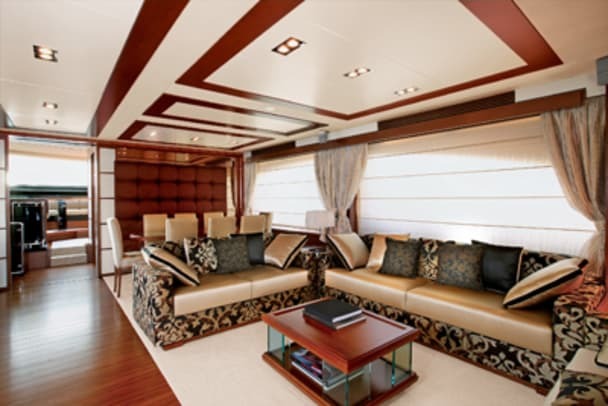 Both boats have standard lower helm stations, the 82’s to starboard and the 80’s to port, but the stairway to the lower level has migrated from starboard to port and the new boat has received an L-shape settee just forward of it that lets occupants converse with the helmsman and enjoy a fine view forward. Changes on the lower level are a bit more substantial, at least for the owners. That amidships master used to be separated from the engine room by a crew cabin, but on the 82, the crew lives aft—like up against the transom. Thus the master can be marginally larger and insulated from the engine room by a full-beam en suite head with a full-size tub (new) and two MSDs, one for him and one for her. (There are five Tecma MSDs in all, plus one for the crew.) The principal upshot of this is that the 80’s port and starboard PWC compartments are gone, replaced by the crew quarters. As for tender/PWC stowage, there’s room for up to a 14-footer on the much larger swim platform that can be hydraulically raised and lowered. Exterior appearances have evolved too, but again, not a lot. You see the hand of Stefano Righini in both boats, just as you do that of Carlo Galeazzi in both interiors. 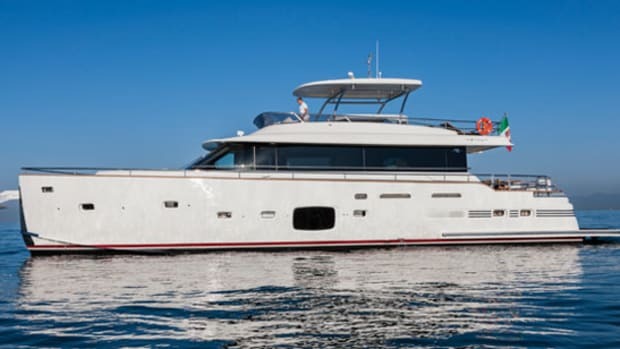 The major changes are more glass area (the master now enjoys four vertical hull-side windows per side instead of three) and a standard hardtop with integral sunroof. (The 80 made do with a bimini top.) Looking at these two boats from a distance, you can easily see that the 82 is derived from the 80 and that both are Azimuts. The one comparison not possible here is performance, as PMY never tested the 80. I can tell you that I did enjoy my time at the wheel of the 82 on a dead-flat Ligurian Sea, but let’s face it: This is the nautical equivalent of a stretch limo. She goes where she’s pointed in leisurely and predictable fashion, the sound of the engines a distant thrum. There’s no drama, and a 28-knot top end is plenty for a boat of this heft and demeanor, a demeanor that is all about comfort and luxury, just like the 80’s was. That the 82 continues that tradition should come as no surprise. If Azimut took no chances with the 82, it’s because it didn’t need to. It’s been fine-tuning the concept for 40 years. One of the handiest things to have on a big boat is a fuel-transfer system. It allows you to move fuel around to offset uneven loading and to empty or fill a tank in case of damage, contamination, or the loss of an engine. But a common problem with such systems is that they’re abysmally slow; it can sometimes take hours to do a job you need done right away. 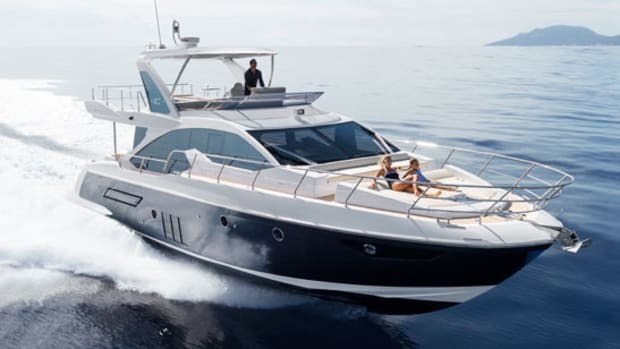 The system on the Azimut 82 not only avoids this pitfall by using a high-capacity 220-volt pump, it includes a cleanable filter that traps larger contaminants before they reach even the fuel-water separators. Thus it can also function as a basic fuel-polishing system. 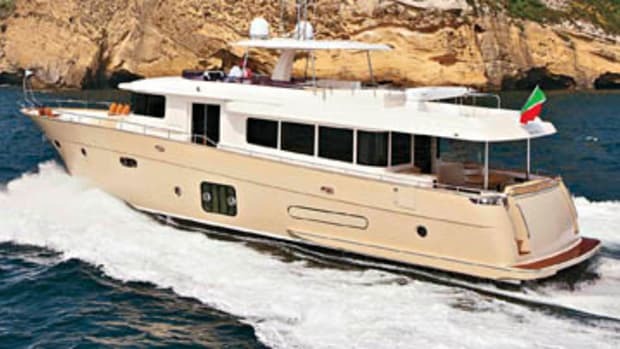 This article originally appeared in the May 2009 issue of Power & Motoryacht magazine.